New Directions Publishing Corporation, 9780811217491, 341pp. 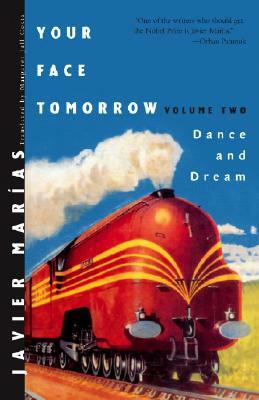 Your Face Tomorrow, Javier Marias's dazzling unfolding magnum opus, is a novel in three parts, which began with Volume One: Fever and Spear. Described as a "brilliant dark novel" (Scotland on Sunday), the book now takes a wild swerve in its new volume. Skillfully constructed around a central perplexing and mesmerizing scene in a nightclub, Volume Two: Dance and Dream again features Jacques Deza. In Volume One he was hired by MI6 as a person of extraordinarily sophisticated powers of perception. In Volume Two Deza discovers the dark side of his new employer when Tupra, his spy-master boss, brings out a sword and uses it in a way that appalls Deza: You can't just go around hurting and killing people like that. Why not? asks Tupra. Searching meditations on favors and jealousy, knowledge and the deep human desire not to know, violence and death play against memories of the Spanish Civil War as Deza's world becomes increasingly murky.